Yesler Terrace is a 30-acre site near downtown Seattle that was developed by the Seattle Housing Authority (SHA) in the early 1940s as the city’s first publicly subsidized housing community. In 2006, when it had become evident that Yesler’s infrastructure and 561 aging housing units needed to be replaced, SHA began a conversation with residents, surrounding neighbors, city officials, key partners and the citizens of Seattle. A vision took shape for transforming Yesler Terrace — a site with great potential due to its central location close to jobs, public transit options and beautiful views — into a model community. In 2013, the revitalization of Yesler Terrace began. What is emerging is a dynamic new community that honors the neighborhood’s history and cultural richness while creating attractive new housing that is affordable to residents across a broad range of incomes. In addition to replacing all 561 original units for families earning no more than 30 percent of the area median income, SHA is dramatically increasing affordable housing opportunities by creating up to 1,100 additional low-income units at Yesler. New parks and open spaces encourage physical activity and engagement among residents, and a new streetcar line through Yesler connects the community to a regional transportation system. 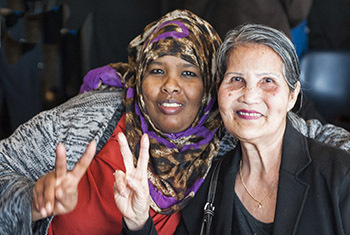 Expanded services for SHA residents at Yesler promote educational achievement, better health, participation in the arts and greater employment opportunity. All residents living at Yesler at the time redevelopment began are covered for related relocation and moving costs, and have first priority for apartments in the new housing.